The location of the July 15, 2002 flare is shown at left. The other panels compare the scale of Earth to the eruptions. Red shows superheated gas held together by magnetic fields. The time sequence lasts only 80 seconds and yet reveals tremendous amounts of gas leaving the Sun. A detailed study of a huge solar eruption reveals that a series of smaller explosions combined in a domino effect to fuel the blast. The findings improve understanding of the Sun's most powerful events and could lead to better forecasting of the tempests, researchers said. 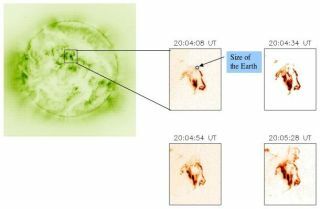 Scientists studied data collected from a radiation flare on the Sun on July 15, 2002. The eruption, ranked as an X-7, was one of the most powerful in recent times. The flare was accompanied by a coronal mass ejection, which is a colossal discharge of electrified gas called plasma. The event was 5,000 million times more powerful than an atomic bomb. Scientists don't know exactly what triggers such eruptions. They are associated with strong magnetic fields, however, and emanate from sunspots, which are cooler regions of the Sun that correspond to bottled-up magnetic energy. "Sunspots are at the surface of the Sun, and are essentially the footprints of the magnetic field," explained Louise Harra of the Mullard Space Science Laboratory at University College London. "The magnetic field reaches into the outer atmosphere in the same way as for example a bar magnet has a magnetic field around it." Researchers had thought the big eruptions are created when magnetic field lines from the core of a sunspot become tangled and reconnect high in solar atmosphere, or corona. The new study contradicts that assumption. X-7 flare started when plasma from below the Sun's surface broke suddenly through. "Below the surface of the Sun a dynamo process is working creating magnetic field," Harra explained in an email interview. "When this becomes buoyant it can rise to the surface of the Sun, and into the atmosphere." The plasma collided with a strong magnetic field at the surface, and the interaction triggered release of "phenomenal amounts of energy," the researchers concluded. There were three eruptions, each triggering the next. The gas was heated to 36 million degrees Fahrenheit (20 million Celsius) before being flung up into the solar atmosphere at 90,000 mph (40 kilometers per second). "We have observed the flows of hot gas for the first time, enabling us to see that several small flares combine to create a major explosion," Harra said. "This may eventually enable us to predict large flares before they erupt." Not all solar flares are accompanied by coronal mass ejections, and nobody knows for sure why. "It must be a combination of the magnetic field strength and the magnetic configuration that will allow field lines to be opened and hence the release of gas," Harra said. The observations were made with SOHO spacecraft, a joint project of NASA and the European Space Agency. The results were presented last week at a meeting of the Royal Astronomical Society.